Teacup Bichon Frise - Would A Tiny Version Of This Popular Breed Suit You? You are here: Home / Breeds / Pure / Teacup Bichon Frise – Would A Tiny Version Of This Popular Breed Suit You? The Bichon Frise is a small, fuzzy, white dog that has begun growing in popularity over the last few years. These dogs resemble a Shih Tzu in personality and adorableness. But they suffer from fewer health problems. This makes them a great choice for anyone looking for a small lap dog. But what if you want a dog that is even smaller than a normal-sized Bichon Frise? Do Bichon Frises come in a teacup version? While there is no “official” teacup Bichon Frise, it is possible to find smaller versions of the Bichon Frise. But these teacup versions are often more complex than meets the eye. To help you completely understand this tiny dog, we have included everything you need to know in this article. There are many reasons why a dog owner might want a smaller version of this adorable canine. Firstly, smaller dogs are more practical for smaller spaces. If you live in a small home or apartment, it is nearly impossible to have a large dog. 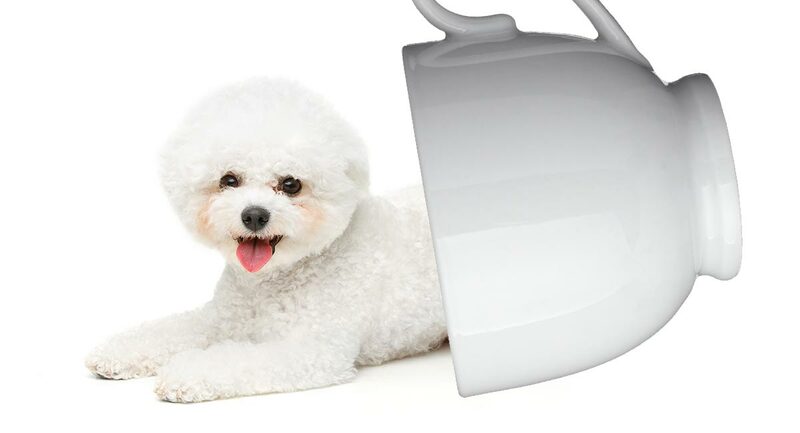 While the Bichon Frise is small anyway, every pound counts when you’re already tight on space. Certain apartments might even have a size limit for pets. Secondly, smaller dogs require less exercise than larger dogs. It isn’t that smaller dogs are lazier than big dogs. But they must exert more energy to move a certain distance. After all, a smaller dog must take a lot more steps to walk a mile than a larger dog. This smaller requirement can be a huge bonus for pet owners who don’t have much time on their hands or who aren’t very active. Smaller dogs fit better in inside family life than dogs who require more activity. Thirdly, smaller dogs require less food and equipment than larger dogs. Large dog beds are often more expensive than small dog beds. And large dogs need to eat more food than smaller dogs. If you’re on a budget or just trying to be money-conscious, choosing a small dog will usually cost less in the long run. Finally, smaller dogs are more suitable to travel. It is a lot easier to fit a smaller dog in a cage than a big dog. And many hotels that allow dogs have a weight maximum. If you travel a lot and want to take your pooch with you, it is usually in your best interest to choose a smaller dog. Where Does The Teacup Bichon Frise Come From? As we stated previously, the teacup Bichon Frise is not an official breed. Instead, a teacup version of the Bichon Frise must be bred through one of three methods. The most popular and easy method is to breed the Bichon Frise with another, smaller dog. Since mixed breed puppies inherit traits from both parents, it is possible for this method to result in smaller dogs. Another method is to introduce the dwarfism gene. However, this can be extremely difficult and comes with quite a few health consequences. Lastly, a teacup version of the Bichon Frise can be created by breeding runts together. Since puppies get their size from their parents, it is possible for this method to result in smaller than average puppies. Let’s discuss each method in turn. Mixing the Bichon Frise with a smaller breed is a common way to produce a smaller version. Mixed breed puppies can inherit traits from either breed. So it is possible for them to be smaller than the Bichon Frise. However, you never really know which puppy is going to inherit which trait from which parent. It is all a game of chance. This means that a particular puppy might not look or act like a Bichon Frise at all. Or a puppy might not be much smaller than a Bichon Frise. Let’s look at a common crossbreed that can result in smaller than average puppies that look like a Bichon Frise. While a Shih Tzu is not much smaller than a Bichon Frise, this combination can result in small puppies. This mixed breed can be somewhat louder than a typical Bichon Frise and might make a good watchdog. They can also be more stubborn and harder to train. Furthermore, it is possible for these puppies to inherit the negative health traits of a Shih Tzu. But, since they are a mixed breed, they are usually healthier than many other dogs. As you might expect, introducing the dwarfism gene into a dog breed will result in smaller dogs. However, this process isn’t as easy as you might think. The only two ways for the dwarfism gene to be introduced is through random mutation or by combining the Bichon Frise with another breed who has the gene. Furthermore, introducing any dwarfism gene can result in severe health problems. Achondroplasia dwarfism can cause severe spinal problems, resulting in back pain and even paralysis, for example. Dogs with dwarfism can have hormonal problems, are more likely to suffer from arthritis, and can even experience lameness. The problems that arise from the dwarfism gene are not curable in most cases. While the symptoms can be managed, a dog with deformed bones or joints is always going to be deformed. Because of this, we cannot recommend adopting a teacup Bichon Frise with dwarfism. The likelihood for severe health problems is too high. Runts are dogs that are smaller than usual. They aren’t just dogs that are on the smaller end of the breed’s size spectrum; they fall off the spectrum altogether. Smaller dogs have smaller puppies. So, if you take two Bichon Frises that are smaller than average and breed them together, the odds are that the puppies will be smaller than average as well. At first glance, this seems like a fairly efficient and practical way to make a teacup version of a dog breed. However, this method often leads to sickly, unhealthy puppies. Runts are often runts for a reason. Often these dogs have an underlying disorder that has left them unable to grow appropriately. If two runts are bred together, this disorder can be passed onto their puppies. Furthermore, runts are also prone to experiencing more health problems than other puppies. Not all runts have health problems, however. Some runts are only smaller because they had a poor placental placement in the womb. This poor placement prevented them from getting all the nutrients they needed. However, these puppies usually grow up to be normal sized dogs when cared for properly. Therefore, they would not be suitable for creating a teacup-sized Bichon Frise. Is a Teacup Bichon Frise Right for Me? It is possible for the teacup Bichon Frise to be a healthy and happy puppy as long as some precautions are taken. These dogs do best in homes without small children. Little kids can easily mishandle tiny dogs, which can lead to injury and temperament problems. Of course, you should also ensure that your house is maneuverable by a tiny dog. Stairs and areas that require jumping can be particularly difficult for a small dog to get around in. Because of their small size, these dogs are not particularly suitable for active households. They can have difficulty keeping up with owners who are always on the go. We recommend choosing a teacup Bichon Frise that is a mixed breed, as opposed to one created by another method. This will ensure that your new puppy is as healthy as possible. If size is particularly important for you, we recommend adopting an adult teacup Bichon Frise if possible. This will ensure that you know the size your pet is going to be when you adopt. Otherwise, you Bichon Frise might end up being a lot larger than you had imagined. If you want a puppy, we recommend adopting from an ethical breeder. Choosing a breeder is important to ensure that your puppy will be as healthy as possible. Many breeders use health testing before breeding dogs together and socialize puppies appropriately. We recommend steering clear from puppy mills and pet stores, as these places often do not follow ethical breeding practices. However, it is also important to note that many pet stores are moving away from puppy mills and getting their animals from rescues instead. If in doubt, ask or look for information on where the dog came from. Do you have experience with smaller dogs of this breed? Leave us a comment and tell us about it! Roth, James. “Improvement in clinical condition and thymus morphologic features associated with growth hormone treatment of immunodeficient dwarf dogs.” American Journal of Veterinary Research. 1984. Kustritz, Margaret. “The Dog Breeder’s Guide to Successful Breeding and Health Management.” Elsevier Health Sciences. 2006.